Young Muslims were also among those who attended the Holy Mass that Benedict XVI gave in the waterfront in Beirut, on Sunday, September 16. And young Muslims took part in the Pope’s meeting with the Lebanese Youth in Bkerké, one of the many Marian sanctuaries in the Land of Cedars, which is also known as «Mary’s land» because of the Lebanese devotion to the Virgin Mary. Benedict XVI thus also addressed his words to young Muslims. He warmly thanked them for their presence. And he mentioned once again the three pillars of all dialogue – not just the dialogue with Islam: truth (sought and explained with reasoned arguments), religious freedom, and protecting life. That Benedict XVI noted these principles in Lebanon – a land considered an example of religious cohabitation – and that he did at every meeting, without hesitation and without mincing his words, is very significant. It reveals how the relationship with the Islamic world has evolved in the recent past. Since the controversial Regensburg’s lecture, an unprecedented dialogue has taken place. Benedict XVI knows very well that it is pointless to argue about the truthfulness of different faiths, and he is not one who would ever water down Christian truth in order to gain some kind of concession from interreligious dialogue. Instead he focused on shared concerns, to which all religions are sensitive to. This approach was evident when – in the very beginning of his Pontificate – Benedict XVI established the Pontifical Council for Interreligious Dialogue as a section of the Pontifical Council for Culture. What happened after the Regensburg lecture, and then the visit to the Blue Mosque in Istanbul during the trip to Turkey in 2007, made the Pope all the more aware that dialogue among religions needed a proper «framework», also in order not to disturb and lose sight of the work of so many who had been engaged in ad hoc arrangements. That is why Benedict XVI revamped the Pontifical Council for Interreligious Dialogue, and appointed Card. Jean Louis Tauran, a skilled and most senior diplomat, as president of the new dicastery. According to many, it was he who proofread the Papal speeches in Lebanon. Copies of the final drafts of the Papal speeches are shared in advance with journalists. Several of these texts were tweaked to fine-tune references to Lebanese freedom, allowing the Pope to convey a clear message without the risk of a diplomatic incident. 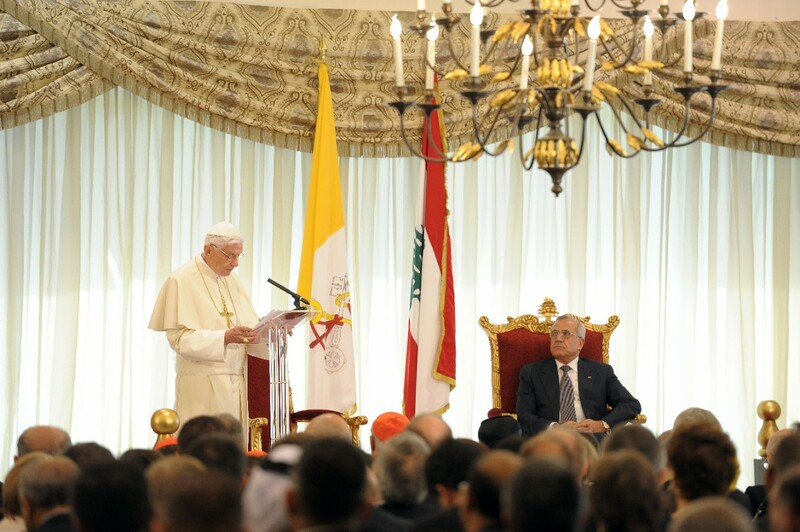 Peace was the key topic of the September, 15 speech the Pope delivered in the presidential palace of Baabda, Lebanon. This speech – Tauran says – was received in an «extremely positive» way by the Muslim leaders and by the Muslim grassroots. «I have been told – Tauran said – that Muslims responsible for the different districts stated that the Pope said exactly what they hoped to hear.» Not even Tauran expected such an enthusiastic reaction. These words shattered to pieces the building blocks of any fundamentalist approach, and directly appeal to religious freedom. Furthermore, Benedict XVI also spoke of the tactic the devil uses in seeking his allies among men. This has an immediate resonance in the Arab world, where Shai-tan, Satan, is considered the spirit of division. However, the speech was delivered while Islamist protests were taking place against a film about the prophet Mohammad that Muslims consider blasphemous. The Pope´s speech received scant attention in the U.S. media. It was almost unnoticed, as religious freedom in general seems to have been forgotten. Yet, religious freedom is one of the main focuses of the U.S. bishops’ agenda. The Pope has focused his pontificate on religious freedom. He has spoken about religious freedom during his visits to the United States, Latin American countries and to France and other secularized Western countries. Above all, he spoke about religious freedom in Lebanon, in a Middle East where religion seems to mean «contrast». 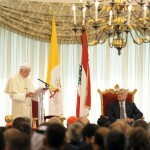 Instead, Benedict XVI put forth in Lebanon two key concepts: communion and witness. These two words were the key of the post-synod exhortation Ecclesia in Medio Oriente, which delivery was the main institutional reason for the Papal trip. The news (and the message) was in these two words, which we cannot afford to forget. I know my audience would appreciate your work. If you’re even remotely interested, feel free to shoot me an e mail. Thanks a lot!